Final organizational requirements for investment firms engaged in algorithmic trading have been passed to ESMA Technical Guidelines for greater analysis concerning the risks potentially raised by technology-advanced trading practices. 2. Dark Pools will be subject to a volume cap. 4%/8% cap for RPW and NTW (for liquid names only). National Regulators can chose to withdraw the waivers if they believe they are being abused. However, final calibrations around what will/will not be applied also will fall under ESMA technical guidelines. 3. All trading to be conducted on RMs, MTFs, SIs or OTFs –OTF is non-equities only, and not using own capital. Less transparent exchanges, or organized trading facilities (OTFs), will be prevented from carrying out matched principal trading (intermediating between buyer and seller), except in instruments that typically suffer from a lack of liquidity. The list has yet to be finalized and again will go down to ESMA Technical Guidelines to establish. But most noticeably, it currently excludes equities. 4. Access Provisions for Exchange Traded Derivatives. Europe’s largest futures exchanges face meaningful competition for the first time. It has been a particularly divisive issue, with the UK opposing efforts from Germany to water down current proposals for more open access to derivatives markets. ETDs are now transitional after two and a half years (instead of two years, previously) and can be renewable once. This means that while open access won the day – it is a day some way off; provisions to allow access to trading and clearing exchange-traded derivatives can be deferred by exchanges operating vertical silos for up to five years if approved by their national authority. Inclusion of position limits on trading firms in certain commodity derivatives to reduce potential speculative activitycontributing to a surge in food and oil prices. The exact limits for the trading in commodity derivatives again will fall under ESMA technical guidelines. Member States will require market participants to file detailed reports “at least” daily. National authorities will also be allowed to limit the size of net positions traders can hold. Exemption for oil and coal commodities from EMIR provisions now extended to three and a half years (instead of 3 years) and, as with ETDs, can be extended two years plus a further possible 1 year. Commission review to be completed by Jan 2018 and might include in REMIT (gas and electricity) products in full MiFID/R scope as part of a new legislative proposal. New Benchmarks will have an obligation to licence no later than 2 years after the financial instrument referencing that benchmark commenced trading or was admitted to trading. b) The new benchmark is not a substitute for any such existing benchmark. Investments that involve contracts of insurance as substitutes to financial instruments should be subject to similar rules as MiFID II. But different market structures and product characteristics make it more appropriate that the detailed requirements are set out in the ongoing review of Directive 2002/92/EC of the European Parliament and of the Council of 9 December 2002 on insurance mediation rather than setting them in this Directive. EIOPA and ESMA should work together to achieve as much consistency as possible in the conduct of business standards for these investment products. 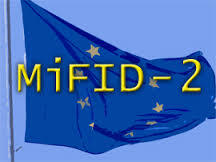 Some believe this indicates that as soon as IMD2 comes into force it will supersede MiFID/R – not that MiFID/R will replace IMD2. EP has also requested annual disclosure of fees. As always the above is subject to reviewing the full and final texts on publication.